If the congressional “super committee” fails to come up with a deal by Thanksgiving — as the media and public now predict — all kinds of automatic budget cuts will take place across the federal government. Decimal points will be moved and programs trimmed without much deliberation. 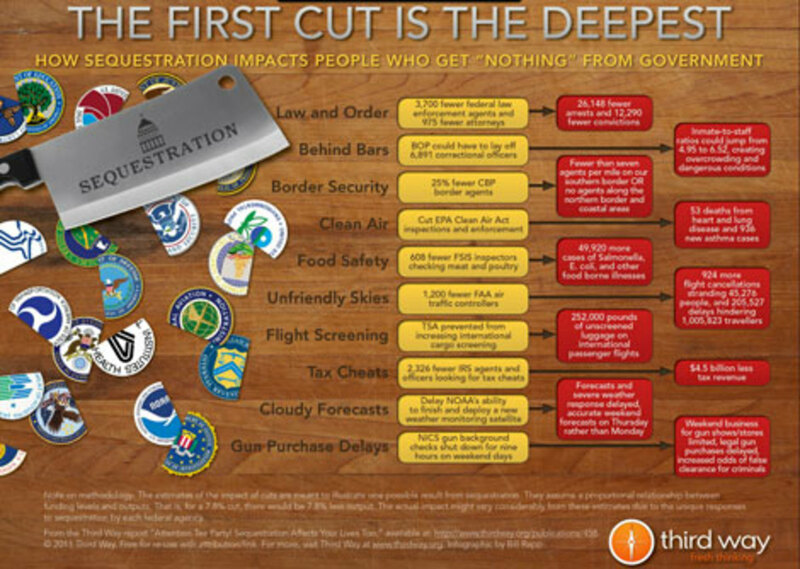 To meet the $1.2 trillion deficit-reduction goal, the Congressional Budget Office estimates that non-defense discretionary spending will have to take an immediate 7.8 percent cut across the board — and that number could cut away at anything. This is where Kendall comes in with some numbers. Those cuts, during fiscal year 2013, would mean 12,290 fewer convictions of criminals by federal agents. They would mean 49,920 more people would contract food poisoning. Perhaps worst of all: 45,276 airline passengers would be stranded at the gate — and more than a million would be late on arrival — as a result of all the air traffic controllers Uncle Sam wouldn’t be able to afford any more. Third Way arrived at these numbers with the help of reports from the agencies tracking their own performance metrics. And these projections are, of course, a collective thought exercise more than a prophecy. But the idea is to inject the specter of real consequences into what’s becoming a common meltdown in Washington. The super committee, that is, isn’t seriously looking at Social Security or Medicare. Other potential targets: the border with Mexico would become more porous, gun purchase background checks would be delayed, and 252,000 pounds of cargo would go unscreened on international flights. At the IRS, that 7.8 percent budget cut might target 2,326 revenue agents who would otherwise be busy looking for people who cheat their neighbors out of $4.5 billion in owed tax revenue. Kendall remains optimistic that the trigger will work as it was intended — that the super committee will be moved to action by Washington’s favorite kind of deadline: the one were everyone gets embarrassed by failure. It might help, though, if more people came to fear the threat of E. coli and uncaptured criminals.